Today want to share with you the case how to add a new button to print alternative Invoice Form right from Invoices and Memos screen. Lets check how does that work and check how original button “Print Invoice/Memo” is configured. Fist of all if you check the code, there is no handler for “Print Invoice/Memo”. That is some sort of virtual button defined through Acumatica Automation Workflow. If you check Automation Steps for “Invoices and Memos” screen you can find that menu “Print Invoice/Memo” is added to action “Report”. That is exactly action that will be executed in the code. If you click “Fill With Values” button you also can see that this action passing some parameters to code. Fields with normal name (like “Printed”) are real DAC fields. Acumatica will put there your value when you click on button. Fields those started with “@” is not a read field, they are parameter of functions in the code. You can see hare that this method has the same name as Action in the Automation Steps and it has parameter – reportID, that was provided from “Fill with Values” dialog box. That’s all, now we know how does it work. 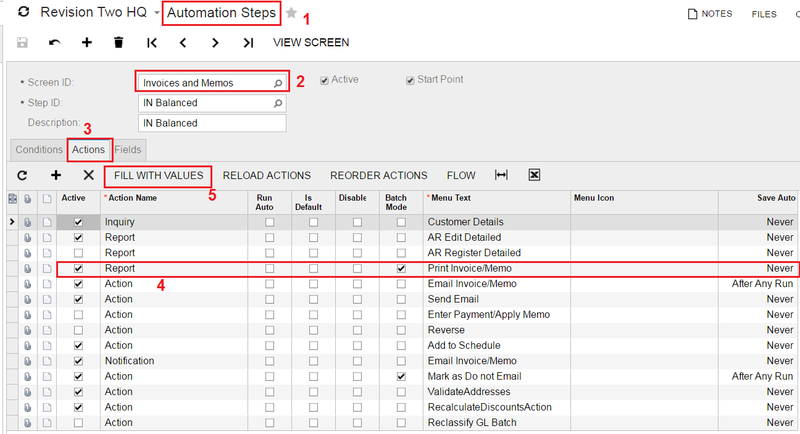 Amend Automation Steps to register a new Action Menu. Please note, that Action will be enabled only on steps where it is defined. That means you may need to add this new action to every single step in Automation (ex Balanced, Hold, Released, etc). Now you can save everything and test the result. I am trying to do this on a new process screen. 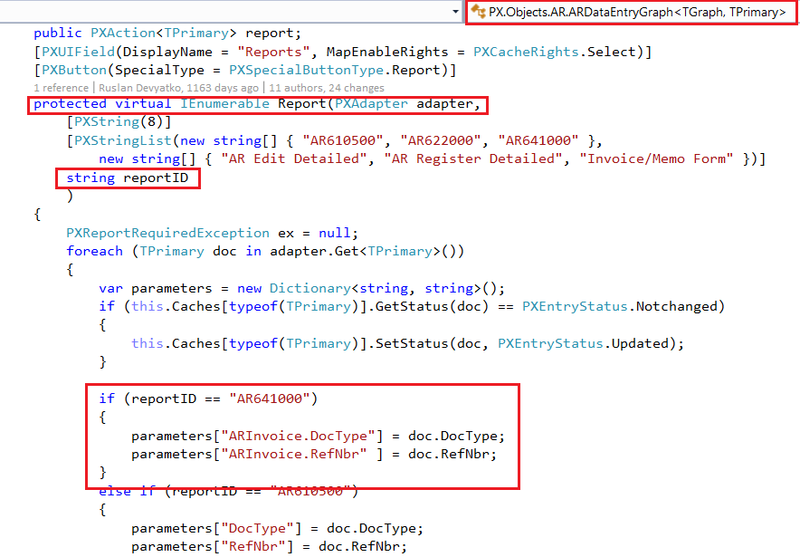 I mean a new Action for Printing Invoice on a process screen with only Customer Ref Nbr as a parameter for a new report. Can you help me on how to start with this? If you have a processing screen than you need to write a logic there to run a report from code. I think you can just write a code that will throw PXReportRequiredException with report ID and parameters you want to pass there. I am trying to add a report on ‘Purchase receipt’ screen, but in the automation steps in ‘Fill With Values’, it does not allow me to put in any value ( reportID ) i want, but rather there is a drop down allowing only the selection of existing related reports. Any ideas what is going on here? I have successfully added a button to launch a report on the Purchase order screen, it is only in purchaser receipts this issue exists.